Anybody who thinks that residents at Coate Water Care residential care homes see nothing but the same old faces every day would be sorely mistaken! The seven homes across four counties are nothing if not embedded in their respective local communities and they regularly welcome all kinds of visitors, from dementia-oriented fitness instructors and musical entertainers to local churchgoers and schoolchildren. In typical Coate Water Care fashion, Mockley Manor Care Home in Warwickshire prides itself on being a big part of its local community in the picturesque village of Ullenhall and the surrounding area. But the latest visitors to the extensively refurbished home are a first … cub scouts! Tanworth-in-Arden Cub Scouts recently became Dementia Friends as part of their ‘A Million Hands’ project. The Friends scheme is a social movement launched by Alzheimer's Society to raise awareness about dementia and involves people undertaking a one-hour information session about dementia and committing to a dementia-friendly action. 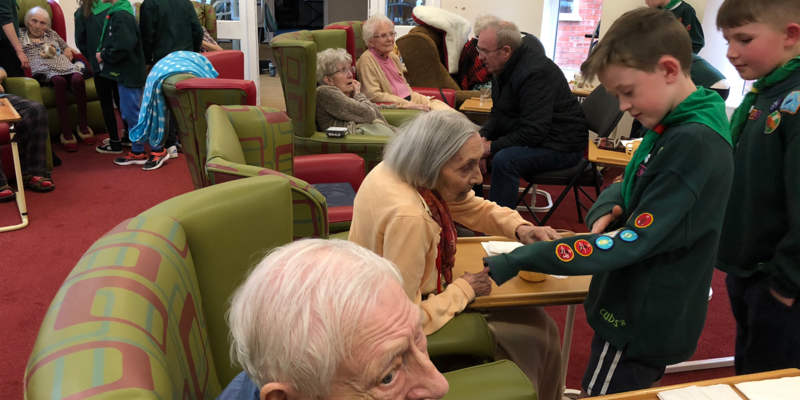 The visit to Mockley Manor was a chance for the cubs to learn more about dementia and get inspired to think of new ways in which they can support people affected by the condition. They learned about the different types of dementia and Alzheimer's disease, heard examples of how it affects people, and talked about how they could turn this new understanding into action. To find out about residential care at Mockley Manor or to arrange a visit to any of Coate Water Care’s seven outstanding care homes in Swindon, Gloucester, Worcestershire and Warwickshire, please contact our ‘Welcome Team’ Michelle or Geraldine on 01793 821200.